As I explained - with last Wednesday's inspiration - there was quite a journey from initial idea to the eventual "Incarnation." But the choice of blue stone - once I had it in my head that I wanted to do a blue stone pendant - well - I tried a number of different shapes - here is what I tried and why I rejected them. Maybe this will give you some inspiration in the future - when you are trying to make a design decision! I tried the rectangle - and really liked the look of the teardrop pendant better. I think the rectangle is too similar to all the squares. It looks like a swing and a miss. I like it - but ... not as much as the teardrop. Maybe because the square and the round are too similar - even shapes - circle fits in a square ... . It's not bad - but the drop is better. This dumorterite was also on my desk - I love the funky shape - but as the colour is a duller blue - it is too similar to the gunmetal - just doesn't pop enough. Maybe you do the same thing - lay out the pieces and try different looks? Try it - sometimes figuring out why you don't like it as useful as finding something you do like! Tomorrow is the Blue Moon - the 2nd full moon in a month - although there is certainly some debate about that definition of a full moon - my significant other and I actually picked our wedding date because it was a "blue moon" - the rationale was that getting married was "something you should only do once in a blue moon." Regardless of whether you are swooning in a blue moon, or simply have teenagers mooning about the house prior to going back to school - you can appreciate t hese Zen Moon Faces. We restocked the white ones, and have these new warm stone-colour ones too! Other faces, less moony, on the same page! And speaking of the kiddies going back to school - are you looking forward to having a few precious hours of time that you can spend on yourself? A few quiet moments to contemplate, to muse - to CREATE! Are you going to head out to that Rustic Adventure that you call a garden, or engage in the Archeology that is cleaning up the garage? Or - are yo u going to work some Ruby Magic - create your own Black Silver Picasso, in Spikes and Daggers. Maybe you are the sort of ultra-organized person who, with the grandkids off at school - is now going to start in on making Christmas presents. Just 4 months to go - and it's not like you can get anything done during December anyway. 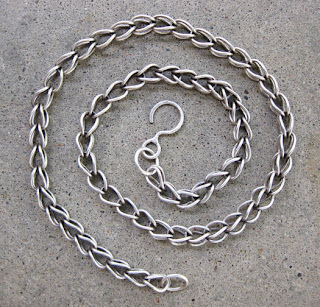 If you are thinking Pendants - then look at these simple twisted rattail cord necklaces. Self-closing - with a loop and a knot, these 20 inch cords are just the ticket for craft fairs and gift-giving alike. By the each or in packs of 10, Chocolate or Black. Kumihimo absorbing all your interests lately? More end kits, and some handsome stone focal beads - perfect for hanging on your hand-woven braids. Choose from Turquoise Howlite, Jade, or Unakite. If big chunky stones are your thing - check out this new tourmalinated quartz! Chunks of quartz crystal with needles of tourmaline entrapped within. Each stone is as unique as you are! And 3 sizes/shapes to choose from! Or perhaps you prefer your quartz water-clear - like a cold mountain stream? We have more of these softly rounded chunks - in a slightly more manageable size than previously! And - if you love dragons - because there's a non-sequitur if every there was one - check out these stone beads with carved dragons, inlaid with 24 K gold! Jade, and Ruby Jade. As always - wonderful things all over the site - so click on a link or an image to go straight to the item mentioned, or go to our listing-o'-everthing and look for the "new" tags. If that page seems overwhelming - which we freely admit it is! - then try for bite-size portions by checking out these categories: Firepolish, Pressed Glass, Swarovski Crystal, Seedbeads, Stone and Pearls, Preciosa Crystal, Metal Beads, Other Cool Beads, Findings, Metal Clay & Supplies or Books, Kits, Tools. Seedbeads. Those itsy bitsy beads of glass. Mini morsels of deliciousness. I've succumbed to their allure like a sailor to a Siren. They said it would happen. It's been years in the making. All those pretty colours calling out to me, beseeching me to buy them. Marg's laughing as I write this, I'm sure. She posted this picture on my Facebook page. I love all the books in Master Beadweaving Series by Lark Publishing. I'm also very blessed to personally know some of the authors. They are very encouraging of me exploring the world of seedbeads. Really, they're just enablers, I say. Before I left for Bead and Button, I bought Sabine Lippert's Beaded Fantasies. I've been dreaming of her Scheherazade pendant for years, and lucky for me it's in the book. I made it in one night, six hours worth of time. And no hair was ripped out of my head!! On Marg's recent trip to BeadFest Phillie, she took a class with Jill and picked up personalized copies of the book for each of us. I've already started working on a Spiral Rope with Peyote embellishments. My goodness, it's like a whole new language. I'm looking at seedbeads in a whole new way. I've fallen in love...hard. This is a test post. Feel free to ignore it. Enjoy this inspiration flower pic. Clover is the new purple. Those of you with kiddo's like myself are doing a joyous happy dance right about now. Only one more week until the little monkeys go back to school! It's also time for us to go back to school - jewelry school that is! Whether you take classes, or learn from books/magazines/videos, it's a perfect time to brush up your skills, or learn a completely new jewelry related skill. Are you a seedbeader? If so, taking some metal smithing classes can help you create one of a kind components that complement your beaded designs perfectly. Those of you who focus on wirework or other types of metal - taking a beadwork class can help you create unique focal pieces that will set your work apart. Jenny our class coordinator extraordinaire is busy working with all of our instructors to schedule classes, and developing new ones. Stay tuned to the blog for more details. The next week or so will be fairly quiet for the last long weekend of summer - but we hope you'll join us next weekend for Anne Mitchell's metal smithing classes. We are so excited to have Anne Mitchell teaching 4 classes at beadFX in September!! She will be with us on September 7, 8 and 9, 2012. Anne started her creative career years ago as a professional lighting designer. 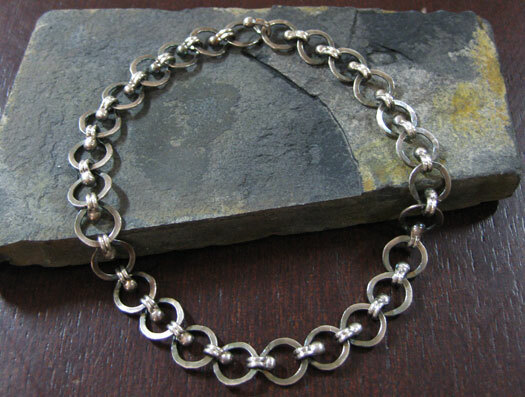 Looking for another outlet for her artistic energies, Anne began teaching chain making and metal working for just pure enjoyment. During those years, Anne found that the creative outlet provided by teaching, as well as a consistent demand for her classes, was too alluring to deny. Leaving lighting behind in 2003, she is now a full-time designer, teacher, and author. Her classes always sell out at the Bead&Button Show. She is one of the most dynamic teachers, always pushing the technical and artistic limits with her designs. Anne won the prestigious Excellence in Bead Artistry Award in 2009. 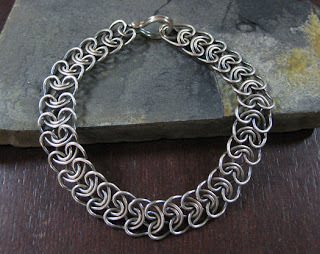 Class Outline: Interlinking and inwoven fine silver hearts create a beautiful and slinky bracelet that molds to your wrist. Join in the fun of making your own. Learn the tips and tricks it takes to master creating the identical links of this almost snake like weave and end it with a unique twist on a classic J-hook closure. 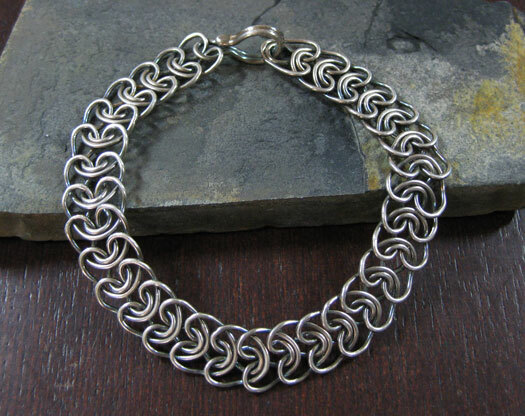 Class Outline: Do you love the look and feel of those heavy gauge silver bracelets? Here is the chance to create your very own. Utilizing the heavier gauges of fine silver wire learn how to cut, manipulate and fuse heavier gauges of fine silver. 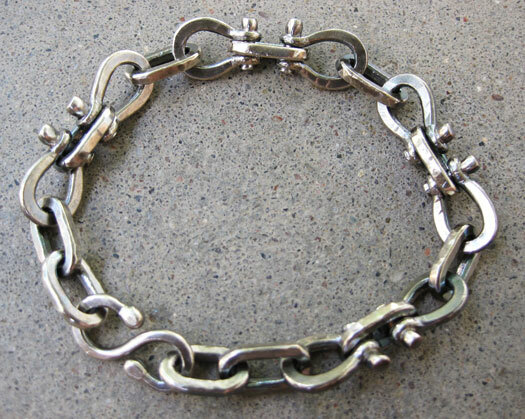 Create and texturing stirrup style connections then riveting the entire piece together for an exceptional looking bracelet. Class Outline: In just a few hours you could make this amazingly delicate and beautiful fused link bracelet. With utilizing the simplest of tools unlock the tips and tricks for creating links that are virtually identical and learn to link together this creation for yourself. 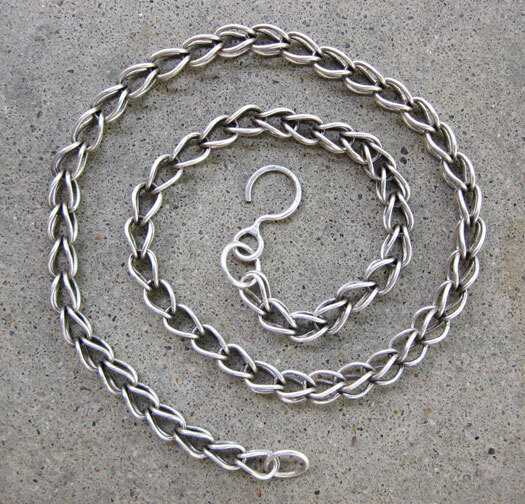 Class Outline: Being able to utilize the finer gauges of fine silver wire to create a beautiful Loop-n-Loop necklace has it's tricks and secrets. Let me share with you over 15 years of metal experience and unlock the nuances of fusing 18 and 16 gauge fine silver wire. As mentioned last week, when Marg was at Bead and Button - she bid on and won this awesome "bead quilt" at a charity auction. The squares are donated by beaders from all over the world. I'm showing this to you one row at a time - up close and personal - so you can enjoy the craftship in each square. The Business Chat - The Joys of Bookkeeping! We're done! The shop has reopened. Breaking News. We ain't Done yet. What I Bought Today at the beadFX sale!